A week ago, I had the chance to visit Portland. It’s a great city that I’ll write about later, but flying out of Portland’s Airport was a pleasure, primarily because of the Priority Pass Benefit courtesy of my Chase Sapphire Reserve (but you can get the Priority Pass Select from other cards too!). This is not just a unique aspect of Portland. I had a similar experience in Sydney this past January, and others have too! The article that Gary references in his post is right in one area – some Priority Pass lounges aren’t great. The article sites overfilled lounges, finger foods, and less than stellar quality beverages. In truth, that first observation is accurate even for American Express Centurion Lounges. The fact is, there were never gourmet meals, lets just dispel that one right now. The best you can get are First Class lounges like the Lufthansa First Class Terminal, or the Qantas First Class Lounge, but you won’t get into any of those lounges with Priority Pass. 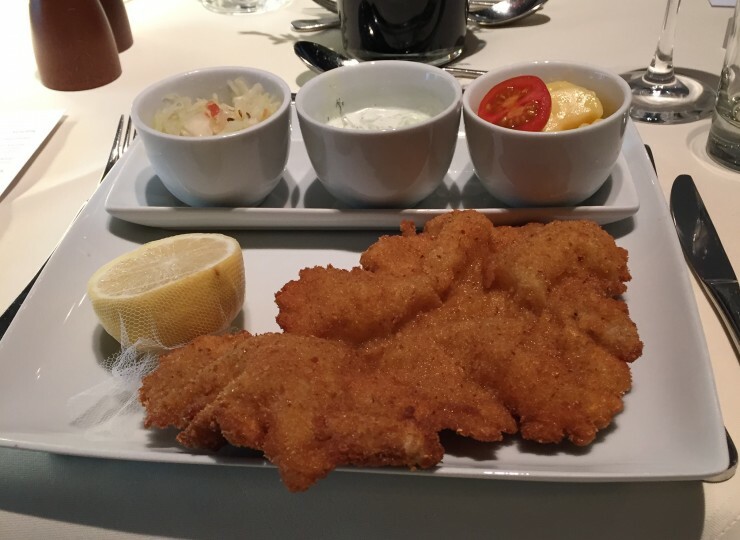 In fact, you won’t get find yourself getting a dish like the phenomenal wiener schnitzel below at a Priority Pass lounge. But, you might get it at an airport restaurant! I would argue that Priority Pass has come to realize the changing times. This is where I would argue that Priority Pass is changing the game for airport lounges. 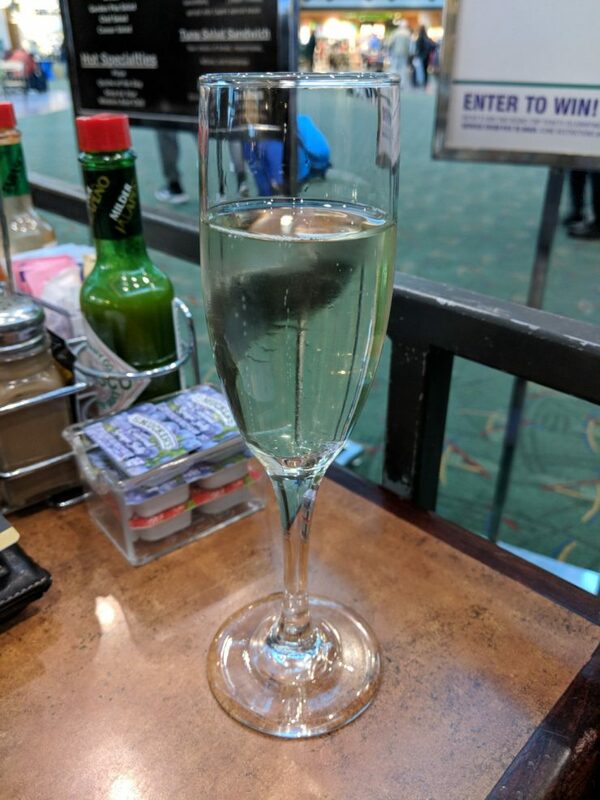 Take for example, Capers at Portland International Airport; here is a subset of my and my wife’s experience a few short weeks ago. 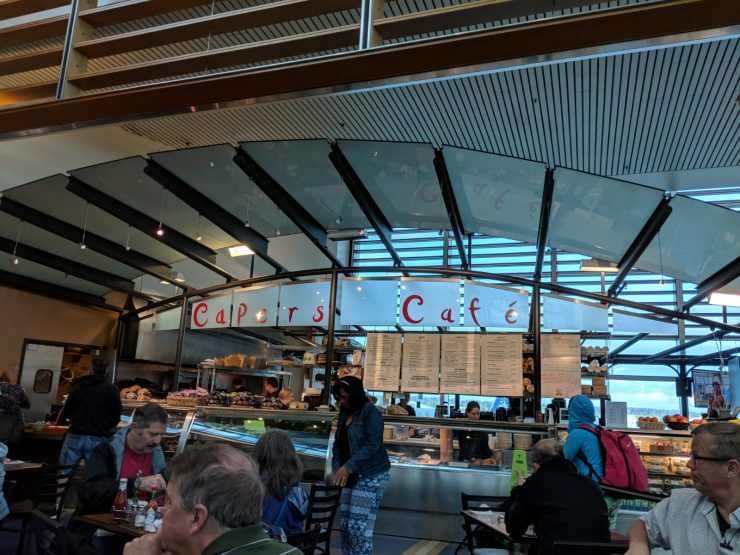 Capers at Portland International Airport, a Priority Pass Restaurant. We received $56 worth of credit, we had a nice breakfast, and even took a few items to go, and you know, had a few glasses of bubbly! The Priority Pass benefit at Capers includes alcohol in addition to food and soft drinks. Our bill at Capers — and look at all you can get with that $56 benefit! Despite airport prices, we still couldn’t spend the entire Priority Pass benefit! Having experienced this though, the biggest feeling I am left with, is the fact that I couldn’t have had that caliber experience in a lounge. Effectively Priority Pass has acknowledged that many non-airline affiliate lounges just can’t compete with the quality that airport restaurants can provide. Many have hypothesized how much Priority pass pays lounges for members to enter. That isn’t terribly clear. What we do know, is that Priority Pass members get between $26-30 benefit per person at restaurants. 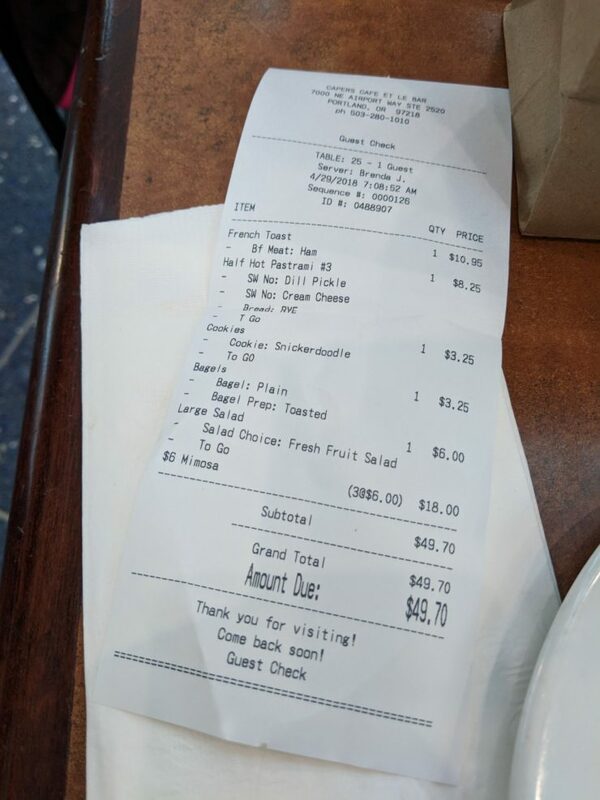 Logically, most folks that are drawn to an airport restaurant because of a benefit, would likely spend more there, so one would surmise that Priority Pass isn’t paying that full benefit amount. But lets just assume that for a moment. It seems to me that folks get greater benefit for the restaurants, where you can get higher quality food, rather than lounges, unless of course you are there for a rather long layover and/or drinking expensive beverages. I love the fact that Priority Pass is innovating here. It’s not clear whether this is a higher cost, or a cost savings for them, but they really are providing a greater value. I’d offer that having benefits at restaurants does fall short of my view of the value of lounges. But you still get a ton of value from eating at a restaurant with real food, rather than the limited options of a lounge. Have you leveraged your Priority Pass membership at an Airport Restaurant? What do you think?